The most Apple iPhone 5s phones come with the Backlight is not working Problem. Therefore, we are provide a new way solution to fix the Backlight problem. Our new way solution to install on your phone, no need to remove or heat your phone Backlight area ic,coil,transistor spare parts because the solution is a Jumper way planning. so we hope the solution will be Easy to you and we’re completely tested, it’s exactly working. OK now, let’s see how to FIX this error. 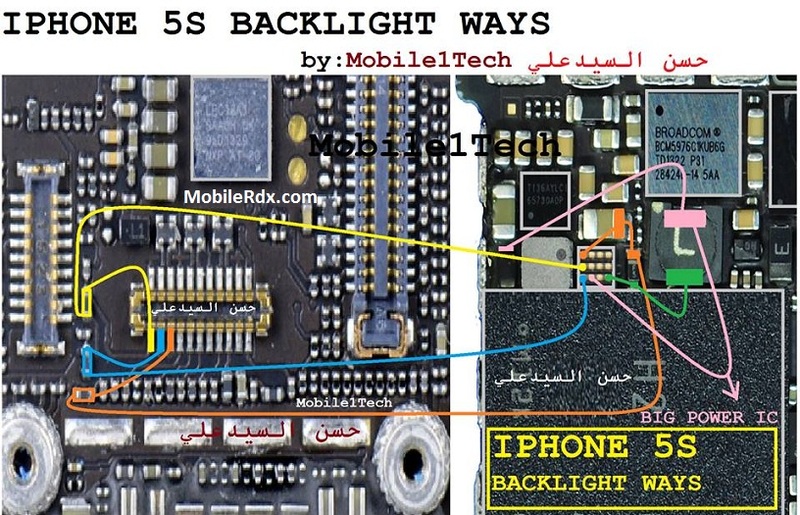 In iPhone 5s there are 3 led lights and their power comes from the LCD’s flex cable. So if your phone’s LCD led lights have stopped working I have marked all of their jumper ways in this diagram. Make the jumper from LCD connector to it corresponding point and hopefully your problem will be solved. Heat Tin with solder for attaching fine wires so that it will closely united. Use a voltage tester to measure the jumper cables. Make sure the jumper cables are connected properly so that it can deliver a good flow. Make sure that the jumper cables are not connected directly with the other jumper cable.